Fixed road bike on singletrack. Typical Cory. and keep reading after that line. Basically the format is this: Story, Shop Events, Shop rides. Every article follows that format. Except this one, because I didn’t want you to miss that bit of info. me: I think we can talk him outta it. Cory is and was known for his avant-garde dress sense. Typical outfits might include a 200 dollar pair of tailored italian wool pin stripped dress slacks, a jersey patched with random fabric scraps, a festive floral print welders hat poached from a farm supply store, Sidi shoes with toes dipped in tool vinyl (ostensibly for wind protection) and gloves so worn that a fortune-teller would have no troubles reading him palm. His bikes often featured such innovative concepts as floor pumps taped to the top tube, non-functional “decorative brakes” and saddle covers, once white, now embued with a distinctive dirt diaper hue. Even his most sedate bikes featured stylistic outliers such as packing tape fender stays (lighter than metal) or bar ends in places nowhere near the end of a bar. He is the only man I have met who has built a full XTR titanium mountain bike that weighs almost 30 lbs. Presumably he reinforced it with rebar. We met at Cory’s downtown fishing shanty in the late morning. The shanty, an offensive and dubious structures in the best of light, leered at us through the haze of the morning. The salmon flesh-colored siding was so porous and rotten that a screw driver could pass through it with a gentle push. A few cans of Sparks were consumed, to help hydrate for the ride ahead. Four bikes were mounted to Cory’s roof rack, which officially only had two trays. Faith and a few dubious and frayed bungies doubled its capacity. Cory, off his bike to snap this sympathetic looking picture, is at far left. Your author, shortly before collapsing, on Dahlgren Road. Cory was leaving, heading to Prague with his wife, a tenacious and good humored Czech woman somehow ensnared into the concept of matrimony. The biking community was going to miss him, and he intended show his gratitude by riding us all into the ground in a rapid fire series of climbs and descents designed to fry our legs and destroy our minds. We started from the South Mountain Creamery, where we were obliged to consume delicious performance enhancing ice cream. The cold sugar and dairy lump resting heavily in churning stomachs, we headed up Reno Monument road. No warm up, no rollers, just start with a big climb and then keep them coming, sucker punch after sucker punch. Reno, Moser, Zittlestown, Dahlgren, Frosttown and so on. 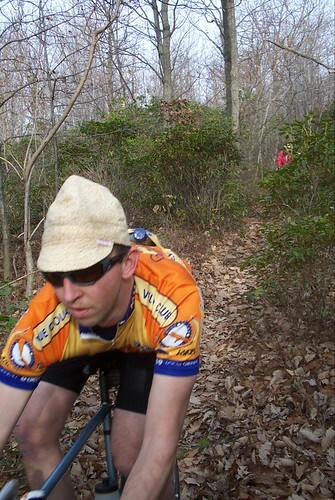 Everyone but Cory walked their fixed gear bikes up the dirt of Dahlgren. Even Gary, a tough and resolute rider who shows no discomfort, ever, was forced to dismount and portage his bike up the murderous slope. He was recovering from a recent gun shot wound to the face, so we’ll chalk it up to that. The summit, for those that are unfamiliar, presents about 25 feet of flat ground, then plunges into a series of S bend turns in a fate tempting descent. Gary, misinterpreting fixed gear for fixie, had brought a brakeless fixie with chopped flat handlebars, half a headset and toe clip pedals. Enshewing such things as safety and good sense, Gary wore a baseball cap ‘helmet’. He prepared for the plunge by turning it backward. His uncontrolled careen down the slope ended with Gary, looking very calm, launching up a steep road side slope, catching a modicum of undesired air, and continuing into a field where he abandoned his wayward bike to its fate. Further climbing resulted in lots of rolling around on the ground agony, cursing Cory’s evil designs. I was glad I wore my Birkenstocks, as the ride devolved into half hike, half ride. We stopped at a friend’s (local frame builder Damien) house and gnoshed potato pancakes (very light) and a small number of Miller High Life beverages. We crawled back to the creamery, Johnny Cash ringing in our ears, and suds and spuds rolling in our bellies. We virtually never see Cory. No one has the cash flow to go visit, and he rarely has occasion to visit. Unfortunately this year he has a had a few family reasons to come back, and so time spent in the states is strained and cloaked in a sense of his impending departure. 1/25: How to true a wheel on a bike, if it gets all out of wack. It’s easy enough to true it in a truing stand, and this will help with that, too, but really, if you wack say, a really fat ground-hog, and your rear wheel goes catywhompus, then you might need to straighten it out, just to get home. This clinic will be about that, not about making it perfect, at home, with all the right tools. 2/1: Bring in the first Wednesday of the down-trodden month of February with a fix a flat clinic. Not only will you learn how to shove a new tube in your tire, but also how to boot a torn tire, patch a hole in a tube, and how to use an old tube to make a really nice bungee cord for zero dollars. Tuesday: Meet at the 7th street Starbucks if it isn’t crappy out for a 8am ride of a super casual 40ish mile ride on a mixed surface. -The Bike Doctor Frederick Crew of Pulchritudinous Super-Excellence. bike adventure, bike doctor in the world at large, bike fashion, clinics/shop events, Czech Defectors, Dirt Road Riding, Dirt Roads, Fixie, Frederick Epics, Frederick Riding, Lots of Pictures for the Illiterati, Monster Climbs, Pass Hunting, Things not to eat, Tiny Caps, Vintage Bikes, Warm Fuzzies, what's your epic?aggregious injury, Bad Fashion, bike doctor, bike doctor frederick, bike doctor shop action, clinics, Colnago, dirt roads, dirt roads in frederick county, dress sense, epic, Epic Rides, fall riding, fixed gear, floral print, Group Rides, Ice Cream, Lugged Steel, Sidi shoes, South Mountain Creamery, Tiny Caps, walking shoes, what's your epic?